Thanks to Energex who last week decided to end the foliar spraying of herbicides on Coochiemudlo Island. 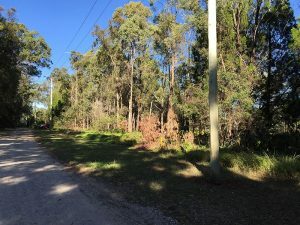 Complaints were lodged with Cr Lance Hewlett in June after the destruction of native vegetation including shrubs near power-lines, especially in Conservation foreshore zones. Last week the issue was amicably resolved when an inspection visit by Energex Vegetation specialists determined there was no need for foliar spraying of herbicides. We were advised other communities in Queensland had arranged alternate protocols with Energex to maintain clearance of TGS (tall growing species) near power-lines without the use of poisons. In future, if the Energex contractor determines a TGS sapling should be removed then Coastcare (in consultation with others, ie Bushcare) can do so, or agree to Energex undertaking a cut stump and swab treatment. This is seen as a step in the right direction as we embark on the development of an Integrated Weed Management Plan with Redland City Council to reduce the use of herbicides in Coochie’s public open spaces and bush reserves. © Coochiemudlo Island Coastcare Inc.